PerryGolf is proud to partner with Azamara Club Cruises for an exceptional 17 night, 6 rounds of golf and sightseeing voyage to New Zealand and Australia on board the outstanding 690 guest Azamara Pursuit. We begin in Auckland, followed by the South Island and Tasmania before reaching Sydney. We’ll savor the wine countries of Marlborough and Hawke’s Bay. Our six rounds on both islands include stunning world #44 Cape Kidnappers, The Kinloch Club and Kauri Cliffs. ... Read More. This voyage presents the perfect opportunity to leave the northern hemisphere’s winter behind for the sunshine and long daylight hours of a southern hemisphere summer! In addition to Christchurch, Milford Sound and the wine country, our New Zealand experience will include the art deco tours in Napier, and the Tauranga’s kiwi farms and of course some of the most majestic natural beauty on earth. After our remarkable passage through Milford Sound we’ll sail for Tasmania in advance of our visit to the iconic harbor of Sydney, one of the world’s most popular destinations. Our golf is equally spectacular. In order to access New Zealand’s finest golf courses, and to better experience the grandeur of New Zealand’s interior, our golf program includes an easy one night off ship overnight stay in beautiful Taupo, with dinner & drinks included. The Tom Doak designed Cape Kidnappers delivers commanding views of the South Pacific and the Hawke’s Bay wine region. Kauri Cliffs, borne from the genius of architect David Harman, is also unforgettable and photogenic, featuring a dozen holes along the ocean. The Kinloch Club is an inland links, designed by Jack Nicklaus. Christchurch Golf Club is the nation’s second oldest club and its Shirley Links has been the host for numerous New Zealand Open and Amateur championships. The highly regarded Tasmania Golf Club enjoys beautiful views and sits just outside the state capital Hobart. Our golf in Melbourne’s Sandbelt will be the Moonah Links Legends Course, a links style layout built to honor past champions who have contributed to Australia’s rich golf history. The guest list will number between 40 and 60, most of whom are golf couples. It’s also common to have non-golfers who will enjoy themselves as a luxury cruise guest starting with Azamara Pursuit’s fabulous facilities combined with a wide selection of Azamara Shore Excursions®. 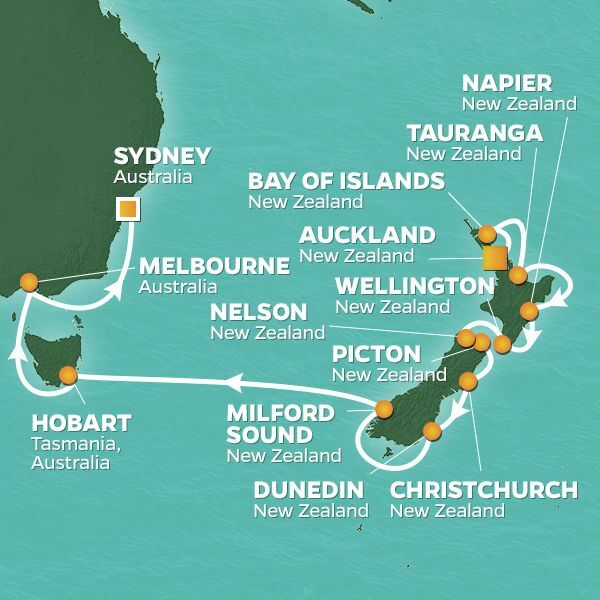 The “2021 New Zealand & Australia Golf Cruise” is a full-featured vacation and a unique opportunity to enjoy yourself in the company of like-minded new friends! Embark Azamara Pursuit beginning at 1:00PM. All aboard by 3:30PM. SIGHTSEEING: Auckland is the capital and most populous city in New Zealand. The only city in the world built on an active basaltic volcanic field; its warm, coastal climate allows for surfing at black-sand beaches, picnics in secluded coves, or horseback riding. Tour a sheep farm, take a guided tour of the coastal rainforest, or go on a harbor cruise. Immerse yourself in Auckland’s art, Māori culture, and history. View the beauty of the coastline from above when you go hang gliding, or take a trip around the winemaking regions of either Matakana or Waiheke Island. GOLF: Kauri Cliffs was designed and built by David Harman of Golf Course Consultants, Orlando, Florida. It is a par 72 championship golf course that measures 7,119 yards with a selection of five sets of tees to challenge every skill level. Tee selection is an important decision here, with gorges and fairways with some of the healthiest and thickest grass in the world making it easy to mount up a tally of lost balls. Fifteen holes view the Pacific Ocean, six of which are played alongside cliffs which plunge to the sea. The beautiful inland holes wind through marsh, forest and farmland. KKauri Cliffs is currently ranked by Golf Digest as #39 among the top 100 in the world. SIGHTSEEING: Tauranga is situated midway on the North Island’s eastern coast, and was settled by the Māori in the 13th century. It is now the most populous city in New Zealand’s renowned Bay of Plenty. A popular coastal town with a subtropical climate, Tauranga features beautiful golden beaches, lush parks, and a laidback atmosphere, while offering an array of adventures including dolphin watching, hiking, fishing, sailing, and diving. Choose from nature discovery tours, a Tauranga sightseeing trip, or even a jet boat ride. Head to Mount Maunganui Beach— a favorite locale with both surfers and hikers alike—or visit such sites as Kaimai Mamaku Forest Park, Kaiate Falls, and The Strand waterfront area for its variety of restaurants, pubs, cafes, and nightclubs. Golfers disembark on arrival in Tauranga (along with any Non-Golfing spouses - reduced rate charge applies) for an easy two round, one night off ship excursion including dinner and drinks plus overnight stay with breakfast in beautiful Taupo. The group will rejoin Azamara Pursuit in Napier, New Zealand on the evening of the second day. Non-Golfing guests who participate on our overland program will enjoy lunch at Cape Kidnappers with the golfers, and then return to Azamara Pursuit on its arrival in Napier in order they may enjoy any of the Azamara Shore Excursions® on offer in Napier in the afternoon. SIGHTSEEING: “Otautahi”, “The Garden City”, “The Most English City outside England”. Christchurch may go by many names, but one thing is certain…there’s so much to see and do in this lovely, energetic city you’re going to have to plan strategically. You can go punting through the city center on the Avon River, or hop on a tram, double-decker bus, or bike to take advantage of the excellent cycleways and paths. Or why not head to the Christchurch Gondola for a spectacular 360° view of the City, Canterbury Plains, Southern Alps, and Banks Peninsula? No matter where you end up be sure to get a taste of Christchurch’s food scene. Enjoy everything Māori Hāngī and an afternoon of high tea, to traditional meat pies, whitebait fritters, and fish and chips. Try a dessert of Anzac biscuits, pavlova, or hokey pokey ice cream and top it all off with a glass of world-renowned sauvignon blanc or a local craft beer. Enjoy Christchurch on your own or via Azamara Shore Excursions®. An option at supplementary cost is provided for PerryGolf guests to go deep into New Zealand’s Southern Alps inclusive of golf at the highly rated and spectacular Jack's Point, with non-golfing spouses able to enjoy free time in beautiful Queenstown. All guests will enjoy an overnight stay with dinner and drinks, and will rejoin Azamara Pursuit in iconic Milford Sound, when they will experience all the drama of this amazing fjord prior to commencing the crossing to Tasmania. February 14 Morning departure from Azamara Pursuit in Dunedin for the scenic 4 hour drive to Queenstown. Lunch on arrival. Afternoon golf at Jack's Point. Nongolfers enjoy free time in Queenstown. February 15 Morning departure from Queenstown for the scenic 4 hour drive to Milford Sound, rejoining Azamara Pursuit late afternoon. Lunch stop enroute. Afternoon arrival into iconic Milford Sound, where we make a scenic cruise of this incredible fjord. Golfers who have participated on the Queenstown option will rejoin Azamara Pursuit in Milford Sound prior to our departure for the crossing to Australia. Another relaxing day onboard Azamara Pursuit, enjoying its many amenities. Another relaxing day at sea on Azamara Pursuit, enjoying its many amenities. GOLF: Moonah Links Legends Course This links style layout was built to honor past champions who have contributed to Australia’s rich golf history. Every hole is named after a winner of the Australian Open beginning with the 2000 titlist Aaron Baddeley. Five sets of tees allow play from 5,586 to 6,946. The par threes will get your attention, none measure less than 170 yards. The 16th – “Gene Sarazen” – is said to have largest green in the Southern Hemisphere! SIGHTSEEING: Melbourne has the honor of being “the world’s most liveable city”, not to mention “Australia’s cultural capital”, a UNESCO City of Literature, the hub of the country’s film and television industry, and the unquestioned sporting capital of Australia. But don’t mistake Melbourne for a relentless over-achiever; it’s got a laid-back and easy vibe that will leave you wanting more. The best way to experience what makes Melbourne so special is to hit the streets and explore. Your first stop should be to fuel up with a cup of ‘jo’. Coffee culture is taken very seriously here and there are all kinds of quaint cafes to be found on the charming city streets. Next take in the restored 19th century architecture – including the UNESCO World Heritage-listed Royal Exhibition building – much of which was built following the Victorian golf rush. Visit the seaside suburb of St. Kilda for such renowned attractions as Luna Para, Fitzroy Street, and St. Kilda Beach; the city’s most famous beach. Stroll through Melbourne’s interconnected arcades and laneways filled with vibrant street art, boutiques, restaurants and cafés, or enjoy a leisurely walk through the heart of the city center at the Royal Botanic Gardens. Enjoy Melbourne on your own or via Azamara Shore Excursions®. Afternoon arrival into Sydney’s beautiful harbour, sailing past the Opera House and under the famous harbour bridge. Tasmania Golf Club, is surrounded by water on three sides and perched atop the picturesque Barilla Bluff. This scenic and enjoyable layout is routinely ranked among the top three in Tasmania. A frequent host of the Australian Amateur and Tasmanian Open, the club moved to its current location in 1971 with this course designed by noted architect Al Howard. The course measures 6,820 yards with a par of 72 for the men and 6,056 yards with a par of 74 for the women. Accurate driving is imperative throughout and the 165-yard par-3 18th delivers a delightful finale. Moonah Links Legends Course links style layout was built to honor past champions who have contributed to Australia’s rich golf history. Every hole is named after a winner of the Australian Open beginning with the 2000 titlist Aaron Baddeley. Five sets of tees allow play from 5,586 to 6,946. The par threes will get your attention, none measure less than 170 yards. The 16th – “Gene Sarazen” – is said to have largest green in the Southern Hemisphere! This links style layout was built to honor past champions who have contributed to Australia’s rich golf history. Every hole is named after a winner of the Australian Open beginning with the 2000 titlist Aaron Baddeley. Five sets of tees allow play from 5,586 to 6,946. The par threes will get your attention, none measure less than 170 yards. The 16th – “Gene Sarazen” – is said to have largest green in the Southern Hemisphere!